unit which is used to remove all suspended solids from the leached liquor. The leaching operation which precedes the CCD operation provides a number of features that can be seen in the satellite image. These include leaching tanks, autoclaves, pug leaching setups, presence of smoke or steam emanating from buildings, chimneys of acid plants, chimneys linked to hot leaching, sulphur heaps, sulphur storage tanks or acid storage tanks. One or more of these features were observable in all 13 mills. A solvent extraction or an ion exchange step or a Resin in Pulp step follows the CCD operation. While the ion exchange columns are easily identifiable in a satellite image, solvent extraction processes are not obvious. However, in some of the mills in our sample, repetitive patterns of buildings along with co-located solvent storage containers help to identify the solvent extraction process. It is difficult to identify features that are unique to the last step of the extraction process-precipitation and drying. Wherever Ammonia is used as a precipitating agent ammonia tanks which have a characteristic shape provide a readily identifiable feature. While the CCDs, leaching and ion exchange processes have clear spatial signatures, the other processes do not always provide robust signatures. Many other minerals such as Copper, Zinc, Manganese, Rare Earths (RE), Vanadium and Phosphorus may share similar extraction processes and provide similar signatures. Our methodology for identifying a Uranium mill therefore had to be modified. If we could find features linked to the process steps in the extraction of these minerals that are different from the process steps of Uranium we would then be able to separate out Uranium mills from other mills that share some of the process steps. Copper mills are the most likely candidates for mis-classification. The processing of copper tailings coming out of froth flotation or of low grade ores may exhibit the leaching – CCD – solvent extraction sequence that is seen in a Uranium mill. However the differentiating factor for the extraction of copper is that after solvent extraction it goes to an electro winning facility instead of a precipitation facility. The typical signature provided by an electro winning facility can therefore be used to separate out a Uranium mill from a copper mill. Copper Tailings Plants are also often associated with large mainstream copper mills. Such copper mills are on an average four to five times larger in size. They also use froth flotation units and smelters that are easily identifiable in a satellite image. These can be further used as differentiators between copper and Uranium mills. Analysis of the Nchanga Copper Mill and some other copper mills confirms the logic of these discrimination features. The application of this classification logic to the Olympic Dam Mill that produces copper with Uranium as a byproduct once again confirms the robustness of these discriminating features. Zinc and Managanese may also use an acid leaching step – CCD – solvent extraction sequence as a part of their extraction process especially while processing the tailings. However, since the final operation will involve electro winning instead of the precipitation step which is characteristic of Uranium, such mills can also be differentiated from a Uranium mill. Scale, smelters and froth flotation units can also be used as additional discriminators. The extraction of Rare Earths (RE) from RE containing ores also involves acid leaching. In the current scenario where RE concentration levels are on the higher side and made even higher through steps like froth flotation the absence of a CCD unit and the presence of multiple solvent extraction facilities should enable one to separate out a RE facility from a Uranium mill. Mills that process ores containing both Uranium and Vanadium can be confused with a dedicated Uranium mill. However the presence of more than one solvent extraction sequence will enable one to separate out a combined Uranium Vanadium mill from a stand-alone Uranium mill. Through the systematic application of this logic an image analyst will be able to identify a Uranium Mill as a Uranium Mill. By eliminating Copper, Zinc, Manganese, Rare Earths, Vanadium and Phosphorus extraction operations the probability that the CCD – Acid Leaching sequence that is seen in the satellite image is indeed Uranium is significantly enhanced. 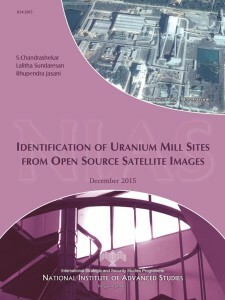 A decision tree created out of these empirical findings provides an easy-to-use algorithm for the identification of a Uranium mill from satellite imagery.